2014 will see three Vancouver history stamps from Canada Post. The 100th anniversary of the Komagata Maru incident will be commemorated in May and Claude Dettloff’s iconic WWII photo, “Wait for me, daddy,” will be issued in November. A stamp commemorating Hogan’s Alley was issued a few weeks ago to mark Black History Month. 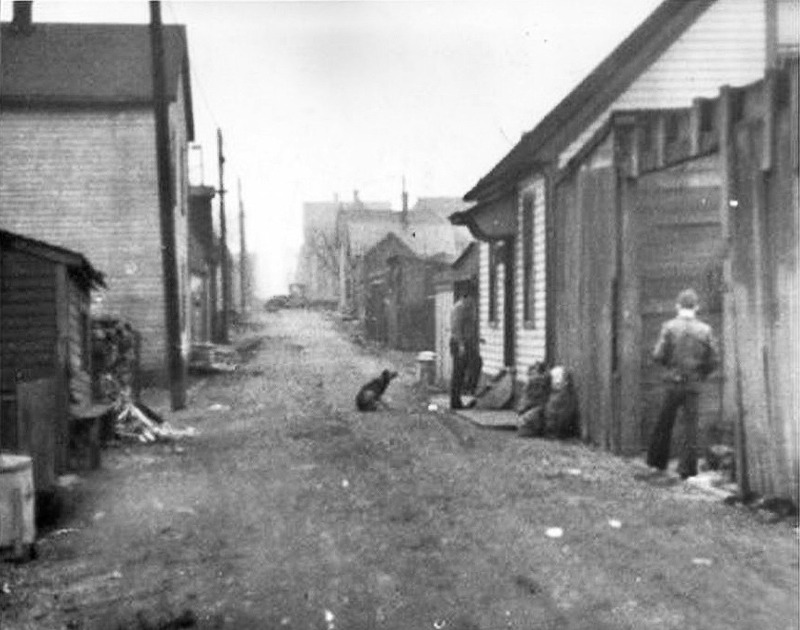 Hogan’s Alley is being recognized as a focal point for Vancouver’s black community before it was demolished as part of an urban renewal campaign. During most of its existence, however, it had a reputation as a hub of vice and crime, not unlike Main and Hastings does today. From outside appearances it didn’t look much different from any other East Vancouver laneway, but some of the rickety shacks lining the alley housed bootleggers, gambling dens, and juke joints. The squalid conditions in the East End generally, and Hogan’s Alley specifically, were often assumed to generate crime and other social ills. Crime statistics were in fact notoriously unreliable when they were compiled at all in the 1930s, and even the police thought it was ridiculous to characterize this small alley as a major crime centre. Some accounts claim that Hogan’s Alley’s bad reputation was due to the behaviour of visitors from other parts of town “slumming it” in the East End. There was nothing but parties in Hogan’s Alley. Night time, anytime, and Sundays all day. You could go by at 6 or 7 o’clock in the morning and you could hear the juke boxes going, you hear somebody hammering on the piano, playing the guitar, or hear somebody fighting. For more on Hogan’s Alley and the black community in the area, see Black Strathcona. Next articlePharrell’s “Happy”, all about Vancouver?